To some, they're lovable urban denizens; to others, their appetite for backyard destruction is a source of constant frustration. But love them or hate them, raccoons aren't going anywhere — and, as a new comedy series from CBC aims to show, they may in fact be deserving of, if not admiration, then at least grudging respect. Created by Canadian director Mike Clattenburg (Trailer Park Boys) and recording artist Mike O'Neill (Moving Day, Trailer Park Boys, Don't Legalize It), Crawford centres around a young man who, after a run of bad luck, moves back in with his parents and discovers that he has an uncanny ability to relate to the raccoons that have invaded his family's home. While Canadian screen luminaries Jill Hennessy, John Carroll Lynch and Kyle Mac get top billing on Crawford, several four-legged actors also make a star turn in the series. The result is a quirky look at family dysfunction that also sheds light on our complicated relationship with the wild creatures with whom we share our urban environments. Here, Clattenburg and O'Neill talk about what it was like filming with live raccoons, and why they hope Crawford inspires empathy for these green-bin bandits. Mike C.: I guess the first inspiration for me was a love of raccoons. I worked with them on Trailer Park Boys, and I was just so taken by how sweet and cute they were. Years later, I watched a documentary called Raccoon Nation and Mike and I were very inspired by it. It really tells you just how intelligent these animals are, but the strangest thing is that through years and years of eating our compost, they’ve lost the ability to hunt. For our story, we did some research and thought, what’s the first thing you’d do if you caught a raccoon? Well, you’d take it into the woods and release it. But if you do that, that raccoon is helpless. That raccoon will absolutely starve to death. We thought that conundrum was interesting. Mike O.: We actually let the facts guide what we wrote. Raccoons are a huge problem in Toronto, of course, and people have tried to come up with solutions, like putting locks on green bins, but what isn’t presented is the effect of doing that — that raccoons will starve if they can’t get into green bins. Writing a show about the problem and keeping it comic and using facts to guide you and finding creative solutions, it’s very fun, and you can also educate people about raccoons while you’re doing it. Mike C.: One of the ways we like to work with animals in the show is to let them do what they’re going to do. You know, you can write a scene where a raccoon jumps up on a table and knocks over a glass of milk, but what we would do is we would hope that would happen. We would have the raccoon sitting on the table, but if the raccoon didn't knock over the milk, we’d rewrite the scene based on whatever the animal was feeling to make sure they weren't stressed. Sometimes we had to sit and wait a long time. You set the cameras up and just keep shooting, and the actor is waiting for something to react to. The animals, their truth is always stranger than fiction and usually it’s much more fun. They’re the best actors I’ve ever seen. Mike O.: At any given time, you can have as many as 30 or 40 people on set. You know you’re only going to get one shot at an unpredictable action that this animal is going to do, and you have to make sure there’s no distractions, so everybody has to be motionless and out of sight. There's a well-known saying, "Don’t work with animals and children," because of that random element that can come in, but we were very lucky to get exactly what we wanted in many situations. 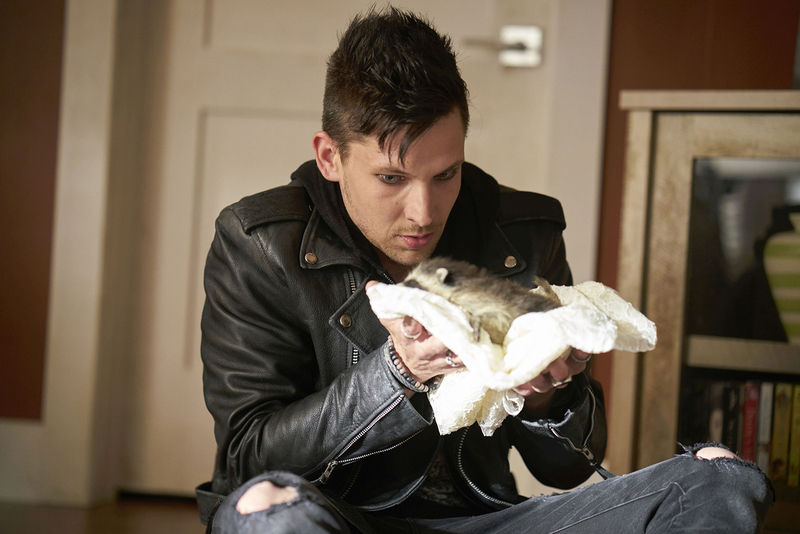 Mike O.: What ended up happening is because this character Don, played by Kyle Mac, has this ability to communicate with raccoons, we used one raccoon for all of their scenes, so an actual relationship developed between Kyle and the raccoon, whose name was Maria. She became more and more comfortable with Kyle and it just made for some amazing connections onscreen. Mike C.: In many scenes, Kyle is very close to Maria; he leans down and he’s kind of sweet-talking her, and eventually the raccoon started to recognize him and like him. There's one scene where he rescues a raccoon out of a tree. It was pretty incredible; the raccoon felt safe enough to climb down the tree and jump into his basket. We didn’t expect it to go that far, but Kyle continued to act the scene with the raccoon trying to climb out of the box to sniff him. He really engaged the animal and it really had a relationship with him personally, moreso than anyone on set. Mike O.: There are a lot of raccoons in Toronto, and I’ve run into them randomly in predictable situations, like on garbage night, and the thing that’s really interesting about them is they will stop and look you in the face. It’s like they're waiting for you to do something, say something; there’s a layer of genuine curiosity there and that’s something that’s built into our show. There are two or three shots of Maria looking straight into the camera, and it really captures that mesmerizing moment, and that’s something I’m really happy about. I think our show serves to remind people that if raccoons annoy you, just the fact that we made cities played a role in their booming population, whether we meant to have this outcome or not. It’s not a preachy show, but it is a reflection of what’s going on. Mike C.: I'm hoping that after seeing the show people might have a bit more empathy for raccoons. A lot of people do care about the animals, but at the same time I can’t imagine how difficult it would be for a family who has raccoons in their attic destroying their house – and they really do destroy the house, that’s one of the things we’re working into our series. It really is a dilemma of man against nature. We can’t live with this animal that is our parasite, but we have to. And they’re such cute and sweet little creatures, but they can be devastating in many ways. I don’t know the answer, but we’re stuck with them, and they’re stuck with us. Crawford begins streaming Feb. 2 on the CBC TV app and at cbc.ca/watch.